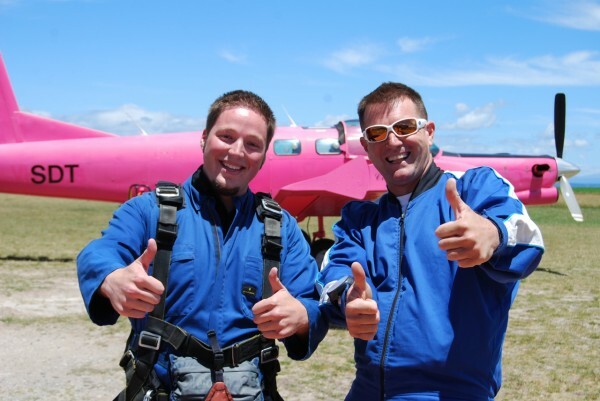 Although we posted a video of our skydive - we never blogged about it! I told William that I definitely wanted to go skydiving while we were in New Zealand. William wasn't too excited about, but we went to check a few skydiving places out while we were in Taupo. The first place we went to showed us a video of a group of divers and and I looked over a William and it was clear that he wasn't impressed. He really wasn't in the mood to skydive. So I got him to go look at another place - Skydive Taupo which was right next door. We went in there to check for pricing and it was the same as the rest. Then the guy said that we should see a video of a dive. We had already seen one at the other place, so we didn't really want to waste time watching another one. But the guy insisted so we reluctantly sat down to watch the video. After the video was over, William looked at me and said, "OK, I want to Skydive now." We waited around in Taupo for a few days for the weather to clear up. We finally got the green light and a weird looking limousine came from Skydive Taupo to pick us up. We met with our skydive leaders and they suited us up and within minutes we were crammed into a small plane and bouncing towards the runway. I was the one by the door which was open while the plane was getting ready to take off. I asked several times if they were going to close the door because we weren't wearing seatbelts and I didn't want to start falling prematurely. It was so loud in the plane that they didn't hear my question, but before the plane took off, the clear door slid shut. I can't say I was too nervous. I think it was just because everything was happening so fast that I didn't really have time to think about it. Before I knew it, I was strapped tight to my skydive leader Mac and my feet where dangling 15,000 feet from the ground in the cold air. Seconds later Mac slid us out of the airplane and we started to fall to the ground. The sensation of first falling out of the airplane was completely unexpected. It's really like you're jumping off a high cliff at Laural Lake. Your stomach leaves you for a second. We reached terminal velocity within seconds. You truly are weightless, but there is an incredible amount of wind in your face. The sensation of the wind was also unexpected for me. Wind was being forced into my my nose and mouth like never before. There was a hint of that feeling you get when you get water up your nose. I wanted to see if while I was falling I would be so freaked out that I'd forget about what I was doing. So I did a test. I wanted to see if I would remember to do "the el Clinto" on the way down. As you can see in the video, it was the first thing I did. I even came up with a few other moves on the fly - pun intended. Although we were falling for just about a minute, it felt like just a few seconds. The canopy was open before I was done doing all the moves I wanted to do. I only got to "Kung-Foo Monkey." Drifting down to earth was so peaceful. The landing was soft. The whole experience was incredible. So when I get back to Kentucky, I want to Skydive with my whole family. My dad and my little sister are totally in. I'm sure my brother will be in too. But my mom will take some convincing. Come on mom - how cool would it be to say, "I've been skydiving!" « Merry Christmas from New Zealand! What was different about the two places that made william change his mind? @Scott: I think it was because the first one was of the whole group of skydivers. So it was like watching 5 different people doing the same thing. So it was kind of boring. At Skydive Taupo, they keep it one-on-one the whole time so everyone has their own DVD of just them at the end. I am proud to say, "I'm alive and well on the ground." Sam! You know how I feel about gravity and high places! I'll just stay on the ground and pray my family survives. Love you sweetie! Common Dee, my Mom and I are going skydiving in April on her 50th bday. You can do it too!